Former U.S. first lady Jacqueline Kennedy can be said that the fashion leader. Jacqueline's style is so distinctive, full of wisdom and creative. From she move into White House as Kennedy's wife, to be an editor, Jacqueline in every decade has left a deep imprint, with her distinct character traits. Now, the luxury trend followers who have the opportunity to follow the pace of her, auction to buy a pearl necklace for her favorite. The pearl necklace belonging to the former Jacqueline have benn auctioned in British, this string of pearls necklace that form by three pearl necklace,it was signature accessories of Jacqueline. 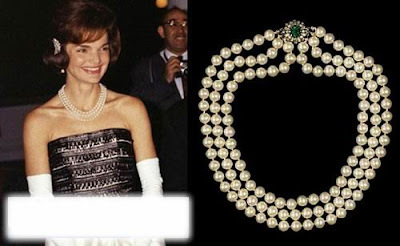 But there are rumors that this pearl necklace inlaid with emerald and diamond is actually fake, because she would often place the jewelry in the wrong place for her careless, perhaps the fundamental value of the jewels was not worth for much money. But as a character accessories once belonged to legendary fashion woman, this likely to be fake pearl necklace, also at auction fetched a high price of 47,000 dollars.